The UK Home Office has published the 2016 annual statistics showing the number of animal procedures carried out in Great Britain under the Animals (Scientific Procedures) Act, 1986; this covers all vertebrate species (and Cephalopods). 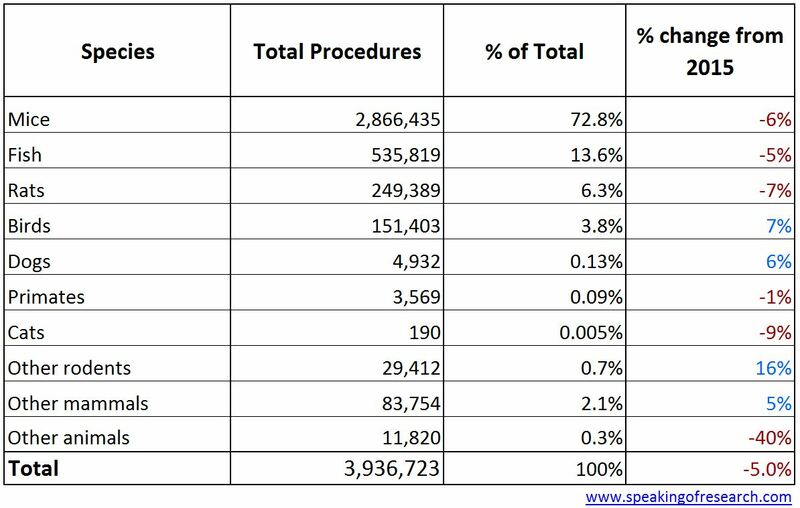 In 2016 there were 3.94 million procedures carried out, down 5% from 2015 (4.14 million). While we often describe these statistics as being for the UK, they do not include Northern Ireland (who carried out 22,508 procedures in 2015), and so are technically the figures for Great Britain (England, Scotland and Wales). 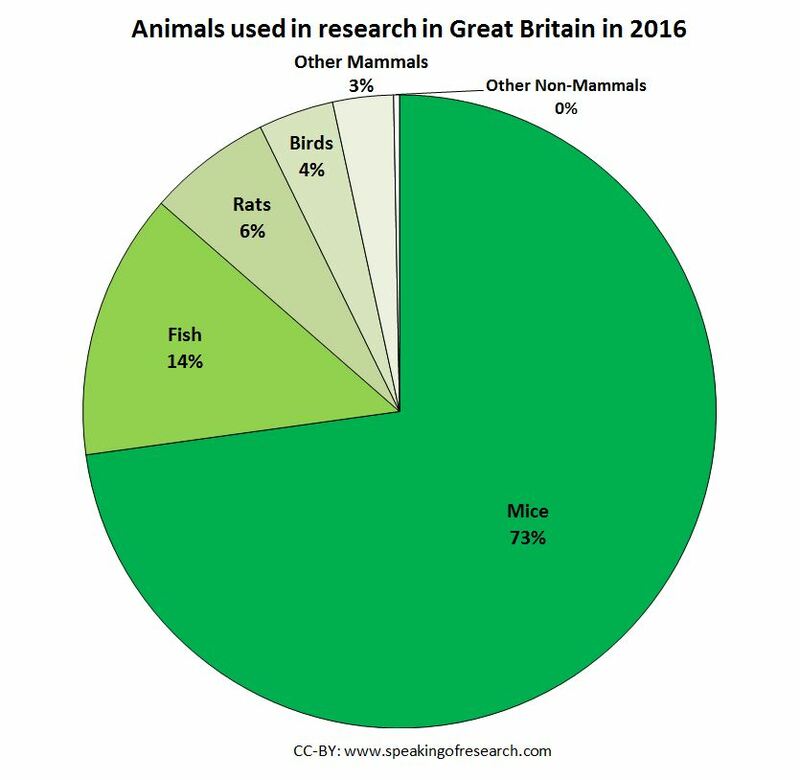 Overall, 96.6% of animals used in scientific studies were mice, rats, fish or birds. Dogs, cats and primates (which are offered special protections under UK law) together accounted for 0.22% of the total (similar to in previous years). The statistics also reveal that almost half of all experiments (48.6%) were the breeding of GM animals which were not used in further experiments – this is almost identical to 2014 and 2015. Overall, 64.9% (almost two thirds) of all experiments involved genetically modified animals, this was down from 67% in 2015. Trend over time in animal experiments in the UK. Click to Enlarge. 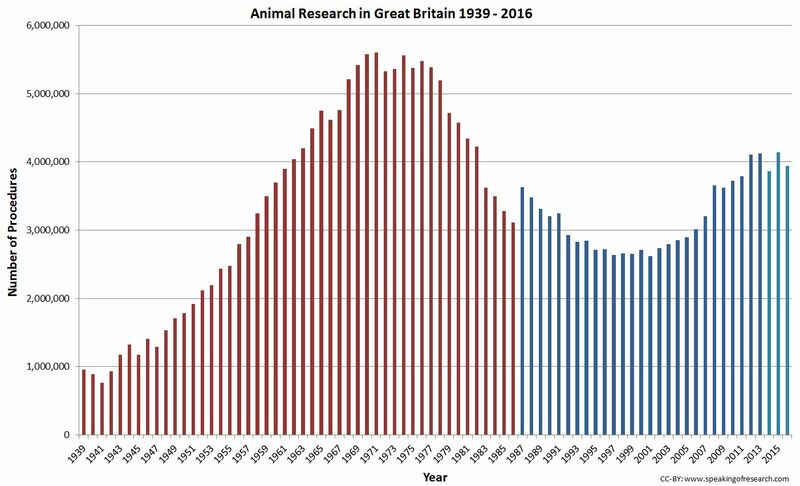 Using the trend graph we can see how the number of animals used in research appears to be flattening out after almost two decades of rising numbers. It should be noted that the Home Office reported in 2015 that it believes there were statistical errors in the 2014 report as a result of new counting methodologies, but that this has been ironed out for 2015 and 2016. The last five years appears to show animal experiments remaining relatively constant around 4 million. While this is higher than in the 1990s, it remains much lower than the 5.5+ million animals used in the mid 1960s. Procedures on non-human primates fell slightly from 3,612 procedures in 2015, to 3,569 (down 1%) in 2016. The number of procedures on cats fell by 19 to 190 procedures and on dogs rose to 4,932. A ban on cosmetic testing on animals (1998) and of using great apes (gorillas, orang-utans and chimpanzees) in research (1986) meant both had zero procedures in 2015. It should be noted that some research may continue on great apes in zoos, however such research can be observation-based only as “procedures” on great apes are illegal under ASPA. For the third time the UK statistics include retrospective reporting of suffering. Rather than just submitting licence proposals to the Home Office that include estimated levels of suffering, the researchers now have to report on what was actually seen (using a variety of measures). Unfortunately, the statistics put these in two separate tables (Table 3 and 8). So we have combined them to get severity for all procedures in 2016. We can see most experiments are sub threshold (38%; less than the introduction of a hypodermic needle), non-recovery (4%; the animal never awakes from anaesthesia) or mild (38%), with remainder as moderate (16%), or severe (3.9%) Overall the proportion of moderate and severe rose from 18.2% in 2015 to 19.9% in 2015 (though numbers in severe category fell). Also of note in the severity data is the rising proportion of sub-threshold experiments in the creation/breeding of genetically modified animals from 45% in 2014, to 55% in 2015, to 65% in 2016, suggesting improving methods. Speaking of Research congratulate the UK government on continuing to produce the most comprehensive statistics on animal experiments worldwide. It is also important to note that these statistics are released as a press conference each year where representatives from the scientific community speak about the importance of animals in research. Posted on July 13, 2017 by EditorPosted in News, StatisticsTagged animal research, great britain, numbers, Statistics, uk. Next Next post: Research Roundup: 50,000 lives saved by organ transplants, transgenic sheep aid in Huntington’s disease, smell relates to weight gain in mice, and more!